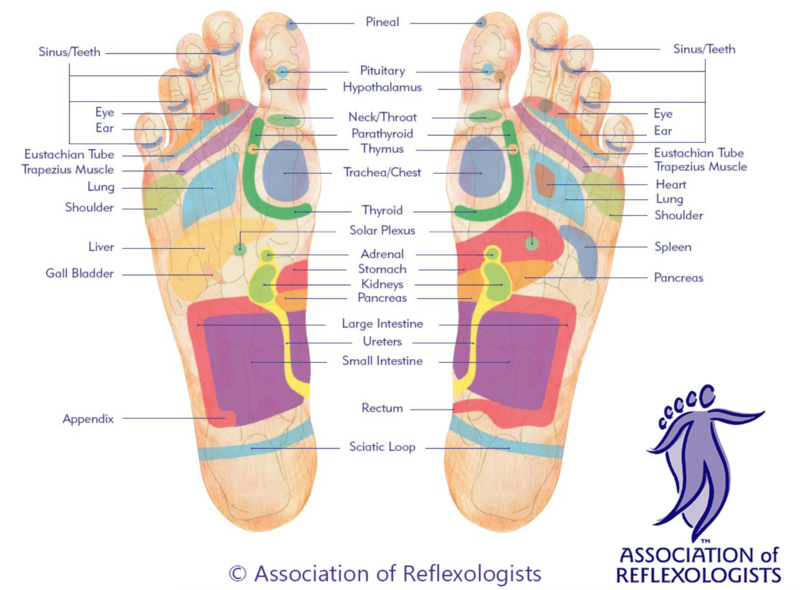 Reflexology involves massaging and applying pressure to specific points of the feet and hands. It’s thought to work through a connection between points in those areas (reflexes) and all of the organs and systems of the body. It’s hypothesised that it helps the body to re-balance and improve its level of well-being by boosting the body’s own healing reactions. Generally people will find that it works at an individual level. By this I mean that some people consider its benefits to be exceptional, some find it good and very occasionally there will be a negligible response. Everybody is different and every treatment is different. That’s one of the fundamental rules of holistic therapy. Reflexology is thought to help with mood improvement, relaxation, sleep, tension release and may also make health problems appear less significant, leading to recipients feeling better overall. Although its origins can be found in many ancient civilisations, reflexology as we know it today is a relatively new therapy, having been developed by a nurse and physiotherapist called Eunice Ingham in the 1930s and 1940s. Eunice discovered that pressure applied to specific reflex points on the feet could help to relieve pain. She went on to publish her findings in two well-known books, “Stories the feet can tell”(1938) and “Stories the feet have told”(1963). Her theories and foot maps are still studied today and form much of the basis of contemporary reflexology. She later became recognized as “The Mother of Modern Reflexology”. By the way…don’t worry if you’re ticklish or have sensitive feet. Reflexology doesn’t tickle (in my experience) and the pressure used can be adjusted to suit any degree of sensitivity. Also, please don’t be self-conscious about your feet. Their condition can sometimes reflect what’s going on in your body so I always view them non-judgmentally. Your session starts with us having a discussion about your health and well-being objectives, medical history and lifestyle. This is so that I can establish what you’re trying to get out of your time with me and offer any self-help advice I might have. It also enables me to tailor your treatment to your own specific needs. The treatment itself starts with me wiping your feet with warm lavender-infused towels (this is as much about acquainting myself with your feet and you getting used to my touch, as cleansing them). I’ll then start to massage them with a beautiful scented organic lotion. Once your feet are relaxed and ready to go, I’ll start working my way, methodically across both feet, massaging and applying pressure to individual points (reflexes) as I go. During the session I keep a record of the treatment on a foot chart. I practice Clinical Reflexology, which means that I work deeply into the reflexes. Sometimes reflexes can therefore feel tender. It’s important for you to say when a point I’m working is tender, or feels different. By letting me know, you will enable me to change my technique, or adjust my pressure, to reduce the feeling of tenderness. Although it’s important for you to be able to feel what I’m doing, I will never work beyond your comfort threshold. The treatment ends with another short general foot massage, ‘to put you together again’. Vertical Reflex Therapy (VRT), Advanced Reflexology Techniques (ART), Precision Reflexology and Reflexology Lymph Drainage I have trained in all of these advanced techniques with the Reflexologists who developed them (or who trained directly with their originators): Lynne Booth – author of the best-selling book Vertical Reflexology; Tony Porter – internationally renowned and respected reflexologist and reflexology trainer; Jan Williamson and Sally Kay. VRT focuses on working the weight-bearing reflexes on the top of the foot (sometimes in conjunction with hand reflexes) rather than the familiar sole where the main reflexes are conventionally situated. VRT is thought to be particularly effective for musculoskeletal problems, but may potentially help with many conditions. ART uses a diverse range of firm reflexology techniques which often involve use of the knuckles. Precision Reflexology is a light touch technique that can feel surprisingly powerful. Reflexology Lymph Drainage was originally developed for working with people with lymphodoema, but it may be beneficial for a range of other issues. All of the treatments I give are based on the individual needs of my clients, and are a hybrid of the range of techniques I have learned and developed over the years. The aim is always to give you the most therapeutic treatment possible. Therefore no two treatments are ever the same. Thank you so much for all your help and support when we were trying for a baby. It worked! We are so grateful and delighted to have our little man (finally). Keep up the good work, you are a talented lady.